The Daniels Pull Plow doesn’t replace your front-mounted plow - it complements it by cleanly removing snow and ice from those hard-to-plow areas that your front mounted plow simply isn’t designed to efficiently handle. Thanks to 2,000 lbs. of downward hydraulic pressure, residential driveways, loading dock areas and circle drives are cleared in record time - right down to the pavement! Since your snow removal actions are always done while moving forward, it’s much safer than backdragging snow into a crowded, busy street! 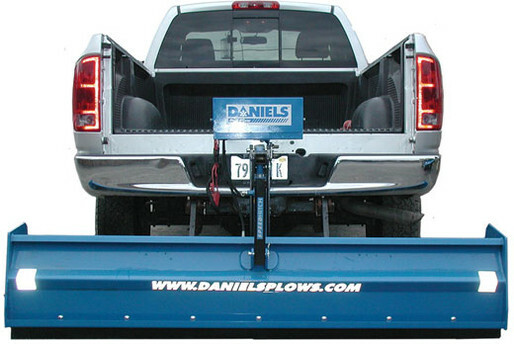 The Daniels Pull Plow fits virtually any 4WD vehicle equipped with a 2" receiver-type hitch. Proven over seven years in the harshest conditions of Alaska, including the North Slope, Daniels Plows introduces the Pinnacle Pusher to the Lower 48 and Canada. Built to the revered quality standards of Daniels, this plow pushes snow and pulls it from curbs, loading docks, garage doors, etc. Operators that switched from traditional box plows have realized increased efficiencies of up to 40%. The Pinnacle uses rubber and steel cutting edges for all types of snow and ice conditions. Imagine having a Heavy Duty Straight Blade, Wing Plow, and Box Plow mounted on the same loader, all at the same time. No more returning to the shop to swap out plows. No more trying to make a Straight Blade do the work of a Box Plow. You don't have to imagine any longer because Daniels 3in1 Plow is here! With a flick of a switch, from inside the cab, this fully hydraulic plow transforms from a Straight Blade to a Box Plow, or any shape in between. Each Wing can be controlled separately, and the entire plow hydro turns 35 degrees in either direction, for an unlimited combination of shapes that best match snow and surface conditions. Pros have used the Daniels Wing Plow with Patented Pusher Kit for years to move large quantities of snow quickly. Now they can enjoy the additional benefits of having a Straight Blade and Box Plow built into the same piece of equipment. By using one plow to both push and stack tons of snow, you eliminate the need for multiple pieces of equipment at the job site. 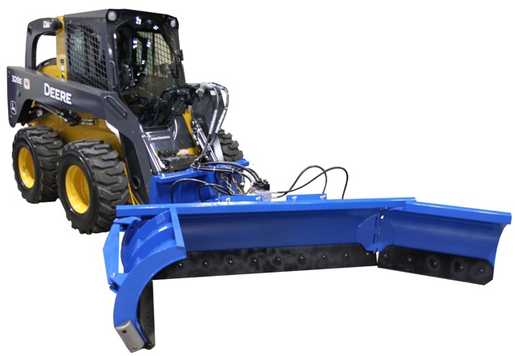 The patented, fold-back wing design lets you reduce the plow size by up to 50% for unsurpassed maneuverability, ease of transport, and when conditions call for a smaller plow size. Up to 35 degree hydro-turning in both directions adds further flexibility and efficiency to your snow plowing. 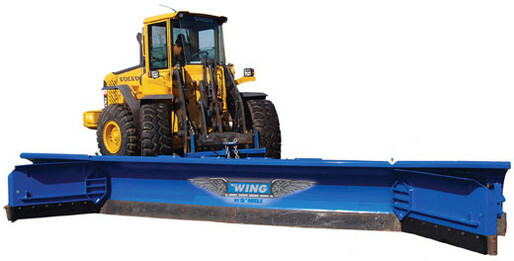 The Daniels Wing Plows are available in four sizes from 14 to 20 feet. Larger sizes built to order upon request. Daniels Wing Plows also are available with options such as the Patented Pusher Kit for better performance. Curb guards can also be added for durability. 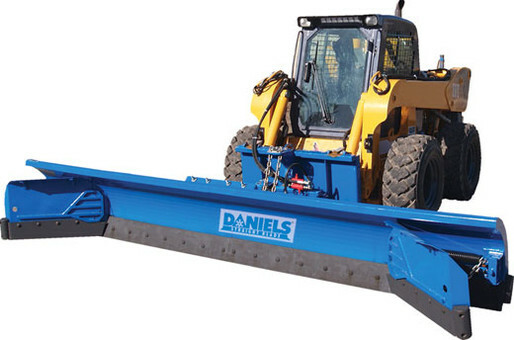 The Daniels Wing Plow also can be equipped to mount to virtually any machine with quick couplers for wheel loaders and skid steers, as well as tractors without a front end boom. Daniels Plows offers the industry's largest skid steer mounted snow plow. Built specifically for skid steers with 2 speed transmissions the Straight Blade will provide incredible high snow plowing efficiencies. Use one plow to both push and stack tons of snow, eliminating the need for multiple pieces of equipment. All 12' and 14' Daniels Straight Blades are standard with the Daniels Patented Pusher Kit, increasing productivity by up to 45%. Leading edges of wings are curved and reinforced with an angled shoe for safety when approaching curbs. Hydroturn the VersaTach Plow 35 degrees left and right in any position. Double-acting Angle Cylinders with 35 degree maximum plow angling. Double-acting Wing Cylinders with 90 degree maximum wing rotation. Hydraulic cylinder rods are black nitride treated for 5x corrosion resistance and extreme durability. Hydraulic Sequencing Manifold with plow angle relief built-in. Preset Pressures on manifold valves. Electric three position switch for angling and independent wing pivot control. Electrical quick disconnect fittings to manifold solenoids. Drive straight on a trailer to easily cover multiple sites.